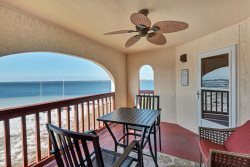 Relax and enjoy great views of the beach and Gulf of Mexico from the spacious balcony of our 5th floor unit. The unit has a master bedroom with king size bed, a second bedroom with 2 double beds, a bunk room with twin size bunk beds. The condo has two full baths. Each room is equipped with cable TV. There is a full size laundry room with washer and new dryer. The kitchen is fully equipped including all appliances, new refrigerator, microwave, blender, etc. No pets and no smoking allowed. Perfect for a family get-away, or a quick escape for yourself, Summerwind 503 C is sure to be what the doctor ordered! These properties are beautiful! We love Navarre Beach because it is quiet and relaxing. Not a lot of traffic but within driving distance of Destin and Pensacola.